Is too much sunshine good for business? Home >> Directors Blog >> Is too much sunshine good for business? What a beautiful day it was to be beside the seaside; a bucket and a spade for the creation of a sandcastle or two. These props were used by Chris Dearden BBC Wales reporter on Colwyn Bay beach at 8am yesterday morning. 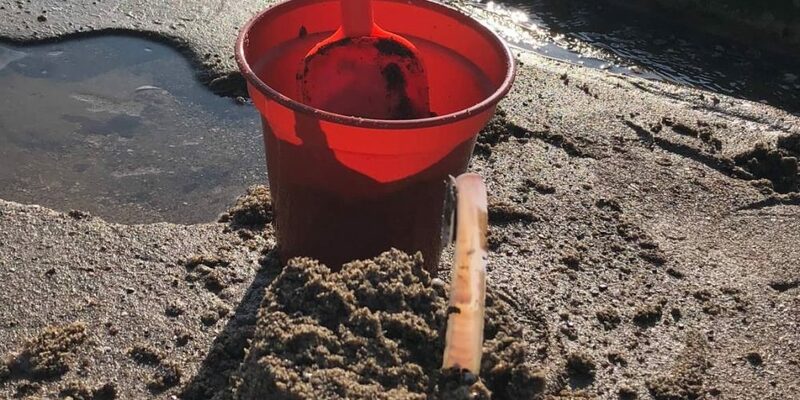 It was a radio broadcast, so I guess the listeners had to take our word that two grown men really were building sandcastles on the beach, but at least it made the sound effects more authentic. We spend so long moaning about the rain and the changeable weather and the lack of sunshine in Wales, and the UK generally, but is that really the only missing ingredient from our tourism offer? Here at North Wales Tourism we did a call out to our 1500+ members, all tourism businesses, to ask them what the impact of this glorious spell of hot weather had been. Deborah, our Head of Membership got an inbox full of responses and the answer… was surprisingly polarized. Many of our accommodation providers; hotels, B&B’s, camp sites and caravan parks were so busy they were full and having to turn people away. Their phones were ringing off the hooks with enquiries. It was the same for lots of cafes and bars. The sunshine was making people turn out, and stay out longer. It’s just what they needed after the poor start to the season. On the other side of the coin, however, our retail members, and those with indoor attractions, or attractions away from the coast are reporting that business is slower, and they were closing a lot earlier than normal. I guess with all this free sunshine, visitors are opting to enjoy the outdoors for as long as they can. Not surprisingly, North Wales has also seen a rise in the number of day visitors. Especially to places like Colwyn Bay beach. Personally I’m enjoying this spell of lovely sunshine as I think it shows off our beautiful environment even more than normal. But I also believe that North Wales has lots to offer, regardless of the weather. So when the rain and the cooler conditions return, no need to feel glum, simply go and explore more of our attractions and inland experiences – they are waiting for your visit!